The Brighton High football team held tryouts last month on the Walter F. Cassidy Playground in Cleveland Circle, one of its many homes away from home over the years. The team lost its home field along the Charles River to disrepair in the late 1980s and has been on the road ever since. Players have practiced at a playground near Cleveland Circle, changing into their helmets and pads under trees, and played games at White Stadium in Franklin Park, a crosstown trek that kept all but the most loyal fans away. All that will change Sept. 9, when the Brighton High Bengals make a triumphant return to their former home, a refurbished Daly Field. After years of wandering, Brighton football will be back on friendly ground, now featuring a shiny synthetic turf. The field is part of the Daly Field Athletics Complex, a $13.5 million project financed by Simmons College, which is leasing the 7-acre state property and has spent five years transforming the neglected tract. The outdoor facility, located between the Charles River and the Massachusetts Turnpike, features a softball diamond, tennis courts, and a lacrosse field, and will be home to a number of Simmons and Brighton High School teams. The Allston Brighton Little League will also play there, and it is available for public use with a permit. The football field, which Brighton High will share with the Simmons College soccer team, cost $1 million to renovate. The field is made from all-natural materials and has shock pads to help reduce the likelihood of concussions, said Jeremy Solomon, director of communications for Simmons College. “There is no other field that is available for public use in New England that is as environmentally sound as this one,” he said. The new field will also have lights, a bright blue scoreboard, and bleachers that seat 200 people. 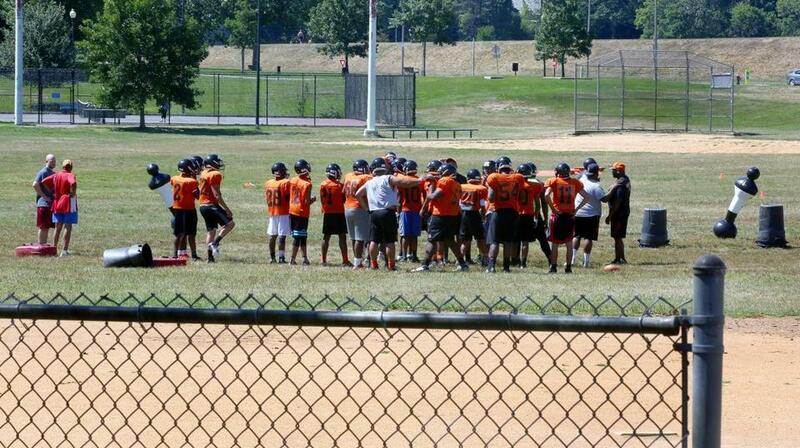 Brighton High will scrimmage there Aug. 30 before its first home game against the O’Bryant School of Math & Science. Supporters of Brighton High football have eyed a return to Daly Field for years, and were heartened when lawmakers in 2012 approved a plan to lease the property to Simmons. But environmental groups fought the plan, saying it would limit public access to the riverfront property. Abraham, who played at Brighton High from 1996 to 2000, remembers practicing in a small lot behind the school. For a program that has not enjoyed home-field advantage for years, the new facility will be transformative, he said. The field was renovated by Simmons College, and the team will have their homecoming there on September 9. In 1998, the team moved its practices to Cassidy Playground near Cleveland Circle, but was always frustrated by the poor conditions, which they blamed for numerous injuries. “Cassidy Field has geese everywhere. Holes, rocks, it always floods when it rains,” said assistant head coach Renel Jean. Jean, 26, was part of the 2007 Brighton High team that went undefeated and won a state Super Bowl despite its nomadic status. Quarterback and captain Nate Hall said he’s eager to play on the new field, but won’t let the excitement distract him from the game itself. James Philip, who coached the football team from 1982 to 2012, was at the last game at Daly Field, and in the years that followed led players through their drills behind the high school, at Cassidy Playground, and at White Stadium. Now retired, he still checks in on the practices and hopes they might reach another Super Bowl. The new field will help the program immensely, he said. Many of the players say their new home is a tribute to all the teams who found success through adversity, and the fans who followed them no matter what. Players head out to the field affter leaving off their backpacks in the new locker room. Miguel Otárola can be reached at miguel.otarola@globe.com. Follow him on Twitter at @motarola123.